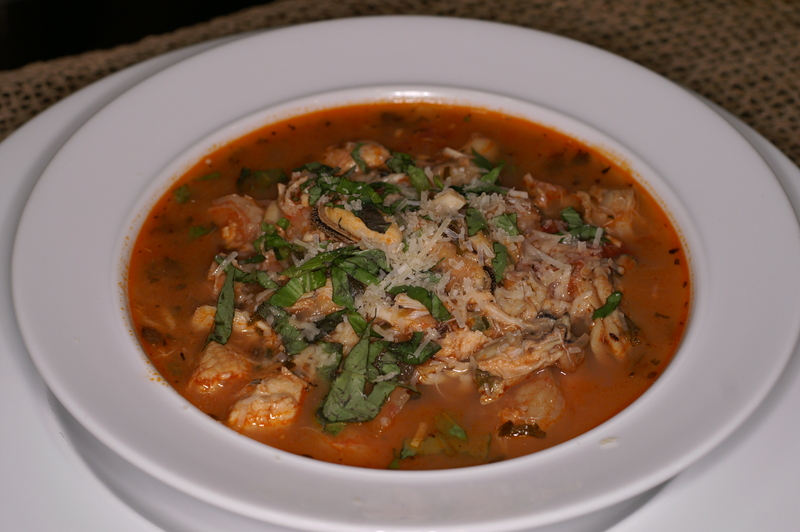 Cioppino is an Italian American classic. While many people believe the dish originated in Italy, it actually originated in San Francisco and was made famous in the 1850s by Genoese immigrant Giuseppe Bazzuro and his abandoned ship turned Italian restaurant bearing his name. Originally, the dish was a purée of cooked vegetables and leftover fish scraps. Over the years, it has transformed into a luscious stew using local delectable shell fish such as dungeness crab, briny prawns, and sweet small shrimp, along with heaps of clams, mussels, and chunks of flaky fish. All of this is simmered with lots of tomatoes and wine. Although you won’t find the same dish in Italy, it is similar to many shellfish soups found along the Mediterranean coast, such as cacciucco, brodetto and bouillabaisse to name a few. Cioppino is generally served with the shellfish cut in half with the shells still on and the mussels and clams still in their shells thereby necessitating special utensils, i.e. cocktail forks, crab crackers and the like. Baby Lady doesn’t like having to get her hands messy during dinner so I remove all the shells when assembling. This undoubtedly is one of those dishes made in heaven. Serve with a large chunk of bread, preferably a nice sourdough. We hope you try it. Over medium-low heat, melt butter in a large stockpot. Add onions, garlic, and parsley. Cook slowly, stirring occasionally until onions are soft. Add tomatoes to the pot (break them into chunks as you add them). Add stock, bay leaves, basil, thyme, oregano, water, and wine. Mix well. Cover and simmer 30 minutes. Remove the bay leaves. Stir in shrimp, scallops, clams, mussels, and crabmeat. Stir in fish. Bring to a boil. Lower heat, cover and simmer five to seven minutes until clams and mussels open. Ladle Cioppino into bowls and serve with warm, crusty sourdough bread. Yummy looking…Cioppino has got to be one of the best dishes, which I first tried on a trip to San Francisco almost 20 years ago. I love the colour and if you are a fan of seafood, you won’t be disappointed. Your recipe looks pretty authentic and I look forward to trying it out soon. Thanks for dropping by and commenting. I’m glad you like the recipe. It is very good! Your cioppino looks and sounds delicious. I don’t like to mess with the shells either so my husband takes care of that for me as well. We do so appreciate the thoughtfulness. Thanks for checking us out and for your comment. We hope you try the recipe and let us know what you think.